Vintage mechanical watch enthusiasts are familiar with the gorgeous Wakmann triple calendar chronographs featuring the reputable calibre Valjoux 730. The company was originally based in New York, U.S.A, but a search on U.S. and European trade mark databases reveals that the brand Wakmann has been secured by offshore company Teddy Bear Group Limited since 2002. So far it seems that the offshore group, based in the British Virgin Islands, has not done much with the brand. In Germany however, Mr. Torsten Nagengast, CEO of Timkeeper Chronometrie successfully filed for and was granted use of brand Wakmann by the German Trade Mark Office. Inside is a refurbished automatic calibre AS2063 manufactured by Anton Schild S.A, one of the first factories dedicated to supplying movement blanks to Swiss brands who dissapeared during the Quartz crisis. Batches of AS2063 sometimes pop up, and small brands love to use them in limited editions. This calibre culminates 40 years of improvements in automatic winding, and still performs very well. 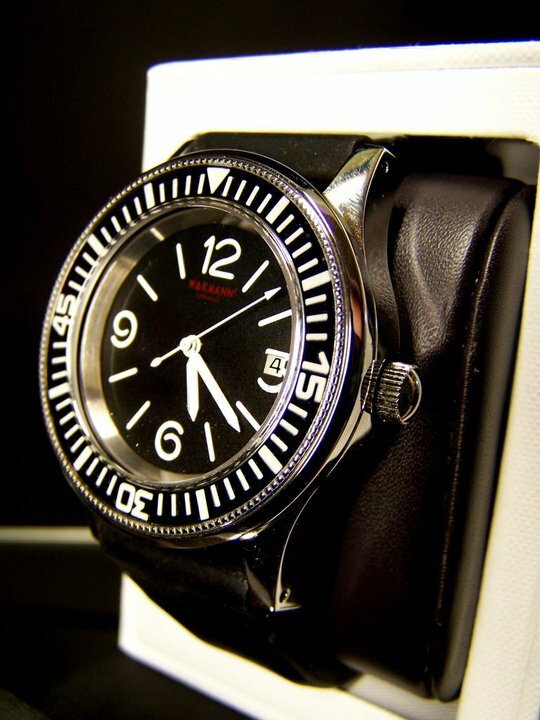 It was used amongst other in the Blancpain Fifty Fathoms, on which Mr.Nagengast took inspiration for the case and bezel. The Seahunter by Wakmann Germany will only be released in 50 pieces. Thank you very much for introducing !!! !